It is an understatement to say that the US welfare reforms of the 1990s were intended to give a little spring to the social safety net. The intention was much more radical, involving a major make-over of income support, and turning what was imagined as a net ensnarling many Americans behind a welfare wall, into a trampoline, a springboard that would incentivize work and allow them to ride a wave of prosperity to higher incomes that would lift their children out of poverty. But this is hardly what is needed when times turn bad. The only virtue of a trampoline when employment falls by more than 8 million, when the unemployment rate more than doubles, and when median incomes drop by over $10,000, is that it catches you on the way down. American families needed a safety net during the Great Recession, and a report released by UNICEF on child poverty suggests, surprisingly enough, that is exactly what they got. The rate of child poverty, in spite of all the macroeconomic turbulence of the last six years, has hardly budged. This is in large measure because of discretionary policy changes on the part of the Federal government that quickly turned the clock back to the welfare system of the 1980s. 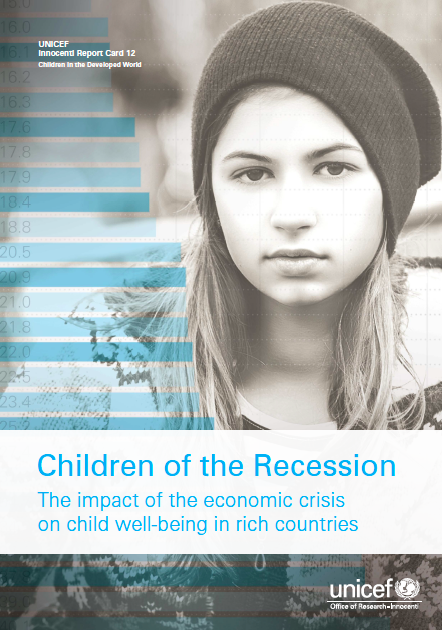 The UNICEF report, “Children of the Recession,” is the latest in a series that every two years or so compares the well-being of children across the rich countries, a series that has repeatedly made the claim that child poverty in the US is among the highest, placing American children in the company of, if you find the numbers convincing, Bulgarians and Romanians. It continues to do so, claiming that one in three American children live in poverty, a slight increase since the recession began, and actually a bit worse than in Romania. In this report “poverty” is defined as the degree of inequality in the lower part of the income distribution, more specifically the fraction of children falling below six-tenths of the middle income. This is a prevailing standard in Europe, but an accompanying background paper by Marianne Bitler, Hilary Hoynes and Elira Kuka, economists at, respectively, UC Irvine, UC Berkeley, and UC Davis, offers a helpful perspective by using a definition closer to what is recommended by the US Census Bureau. Their analysis documents what can be described as a stellar performance of the US in buffering least advantaged families from the sharp edges of the Great Recession. It reveals striking successes, but it also underscores important shortcomings. The failure of the job market to eliminate child poverty may not be a surprise, but it is nonetheless significant. The child poverty rate based upon only market and other private sources of income stood at about one-in-six children before the recession, and shot up after 2007, approaching close to one-in-four in 2010. 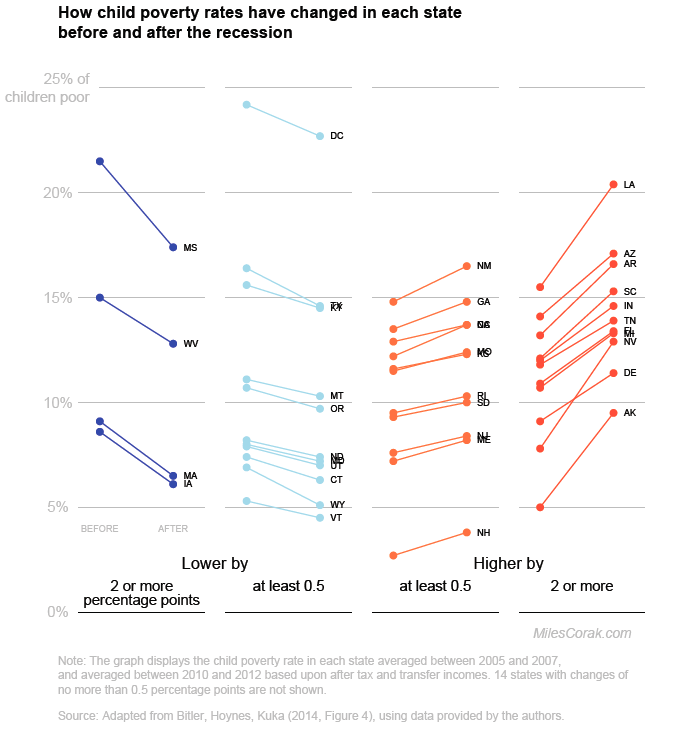 A child poverty rate of about 17% in the best of times, to say nothing of one approaching 25% during the worst of times, drives home a clear message about the polarization of wage rates, their stagnation and outright declines among the lower skilled, and the limited capacity of families to move up the income ladder, both when jobs are scarce and when they are not. 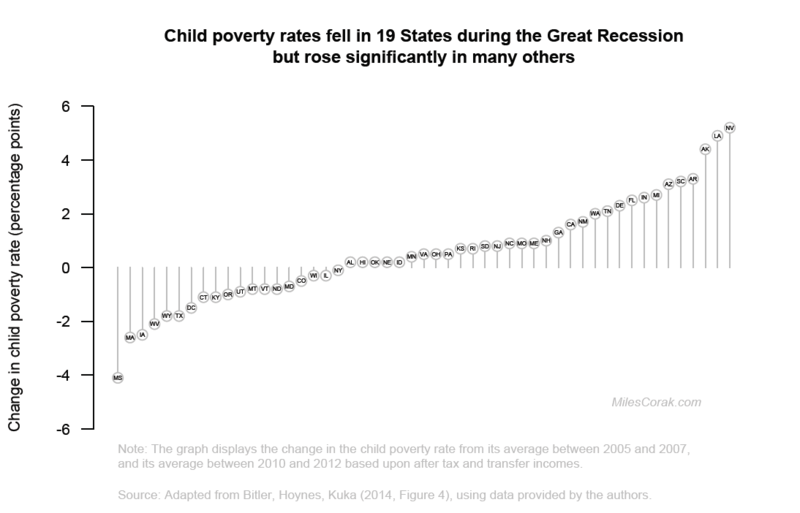 But Bitler, Hoynes, and Kuka also document that the child poverty rate, when measured after all taxes, and including all Federal and State cash and in-kind transfers (with the exception of health insurance transfers), has not changed since 2000, averaging about 12% throughout the recession with no major uptick. As a result a yawning gap has opened up between market income poverty rates, and total income poverty rates, which can only be heralded as a major success story, not for the in-work assistance mode of income support, but for out-of-work assistance, and particularly for those components of the system under Federal control. It’s a Food Stamps story. The Clinton era welfare reforms, designed to mesh with a growing economy and rising employment, set families up for a potential fall during a recession and declining employment. As the authors explain, welfare reform “led to a decline in cash welfare generosity. At the same time, with the expansion of the EITC, the safety net for low income families with children has been transferred from one providing out of work assistance into one supporting in-work assistance.” [page 15] The Earned Income Tax Credit may be the country’s biggest antipoverty program for those with a job, but doesn’t offer much support for those unable to find work. The very significant increases in spending on the Supplemental Nutrition Assistance Program came to the aid of the least advantaged. This relied on actions by the Federal government, but it also exposed the limited capacity or desire of some States to respond in turn. 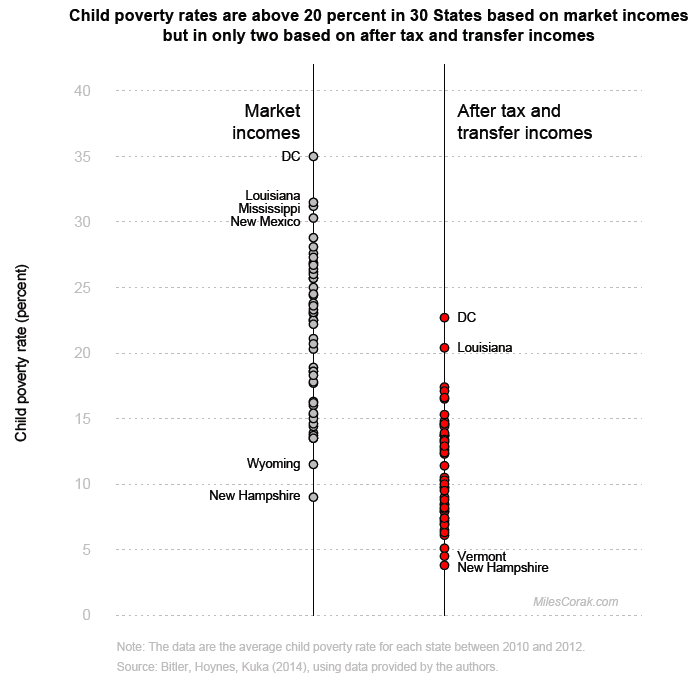 In some places child poverty rates actually fell during the recession, though only in North Dakota, because of the oil and gas boom, did market incomes drive the improvement. Significant increases in market income poverty rates were turned into falling rates by the social safety net in Texas, Oregon, Montana, Vermont, Maryland, Colorado, Illinois, and New York. But in other states with similar challenges much less was accomplished, notably in Louisiana and Alaska. Market income poverty rates that jumped by more than eight percentage points were erased in Hawaii and Idaho, but only partially so in Delaware and North Carolina. And while Nevada saw a 10 percentage point increase in child poverty based on market incomes, that was reduced by about half after government support. UNICEF also points out that the changes in the architecture of poverty relief have the potential to leave the most disadvantaged behind, the situation of families living at less than 50% of the poverty line being more precarious than in previous recessions. While the evidence on this is, at the usual standards of statistical significance, somewhat weak in the Bitler, Hoynes, and Kuka analysis, it does mesh with the findings Robert Moffitt of Johns Hopkins University offered in his presidential address to the Population Association of America earlier this year. But all of this leaves a good deal unsaid. The UNICEF report also reminds us that income is not the only thing that matters in giving children the support they need to successfully navigate the transitions to adulthood, and the severity and duration of the Great Recession suggest that some kids will certainly be scarred long after the unemployment rate falls to pre-recession levels. Major falls in wealth and permanent income as a result of job loss, residential moves as a result of mortgage defaults, and the added stress parents face in having to deal with impeding uncertainty have all taken a toll on the family lives of many kids, whether their household annual income falls above or below the poverty line. The fact that Federal government programs put a floor under family incomes may well be something to be celebrated, but it is not a balm for all of the challenges families and children continue to face, and it is certainly not sustainable in the long run without a robust labor market that benefits the least advantaged in some significant way. « UNICEF gives Canada a passing grade, child poverty actually fell during the recession … or did it?